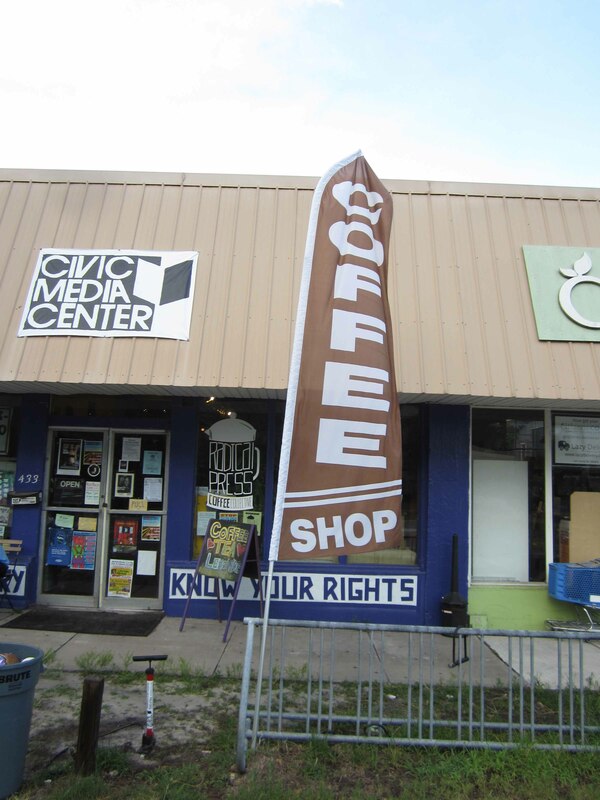 The Civic Media Center will mark the start of its 22nd year on Saturday, Oct. 17, with a fundraising (it just doesn’t stop!) event at one of the coolest and most community-friendly spaces in town, First Magnitude Brewing Company, 1220 SE Veitch St. It is one block east of S. Main and a block south of the Gainesville-Hawthorne bike trail, at the south edge of the soon to be Depot Park. Our event will run from 5-8 pm, and includes dinner prepared from produce donated by various local farms including Frog Song Organics, Glades Ridge Dairy, Possum Hollow farm, Siembre Farm, and Farmer John as well as raffle and silent auction items from local supporters such as John Moran, Civilization, Crane Ramen, Whiskey House,Midnight, Frog Song Organics, North West Seafood and Loosey’s. Great beer will of course be available from our hosts at First Mag. Music and sound system by the Weeds of Eden with other performers TBA. 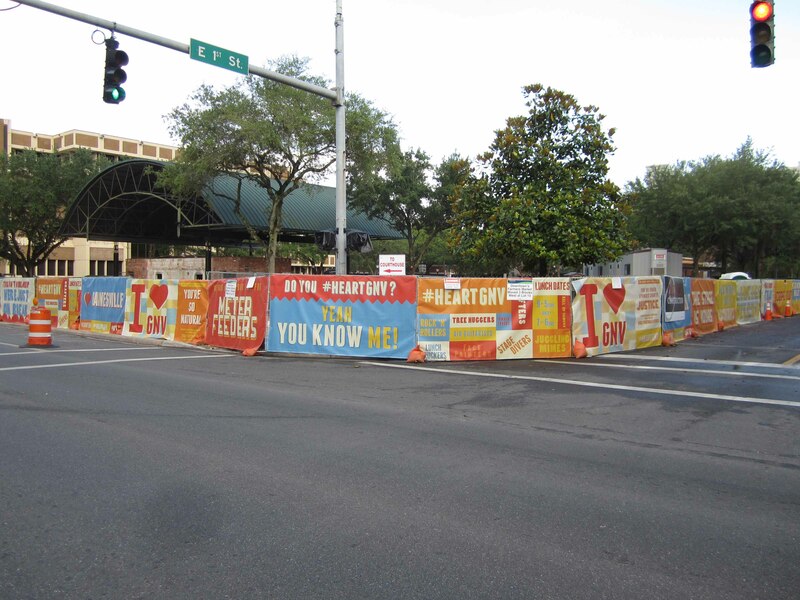 The Fest is an amazing Gainesville happening, wrecking Halloween for some, and largely a bro-fest. (A line of 25 guys was seen lining up to pee in Palomino, while women were just going in and out of their side.) 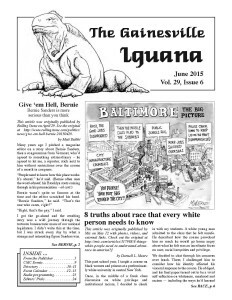 You, Iguana reader, are again invited to spend a day or three at the acoustic side of the Fest, at the Civic Media Center. You will see performers from around the U.S. and beyond in short sets. All ages are welcome with a $10 donation or free with a FEST 14 Pass. The CMC doesn’t make anything from wristband wearers, the walk-up $10 is ours to keep. See the whole schedule at <www.thefestfl.com> and click on bands for background info. 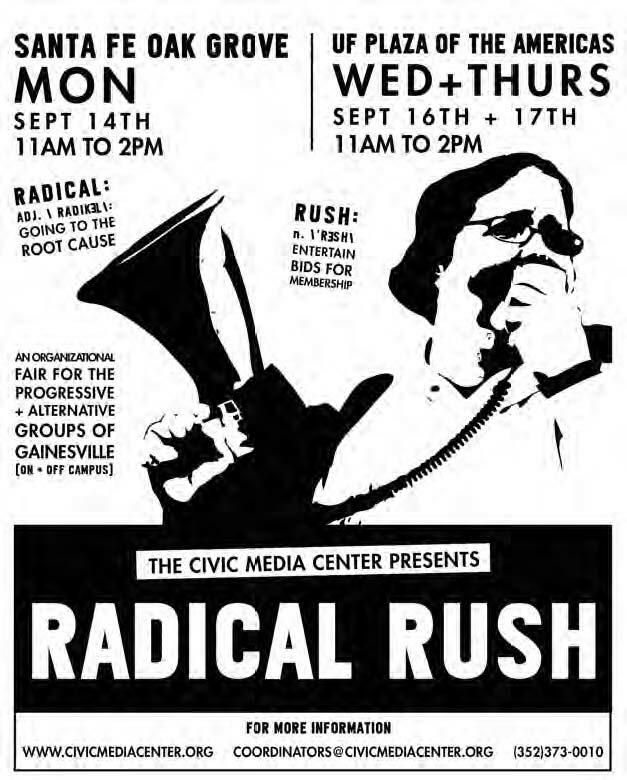 The Civic Media Center has organized Radical Rush since 1998. Radical Rush is an organizational fair for progressive and radical activist groups of Gainesville to recruit new members and publicize their work to students. Radical as in getting to the root of problems, Rush meaning entertaining bids for membership. The Rush is presented in the form of a collaborative tabling effort. Campus and community-based groups participate, with the added bonus of helping to bridge the “town/gown” divide and allow activists working on a wide variety of issues to meet each other, network, and learn about each other’s organizations. Radical Rush also helps break through the generation gap, fostering inter-generational collaboration as students and younger activists are introduced to older, seasoned organizers for a wide variety of causes. Anyone interested in learning about progressive social change and/or becoming more active in the community has the opportunity to talk with members about their organizations. This year’s Radical Rush will run from 11 a.m. to 2 p.m. on Monday, Sept. 14, in the Oak Grove at Santa Fe College, and from 11 a.m. to 2 p.m. on Wednesday and Thursday, Sept. 16–17, on the Plaza of Americas at UF. The Radical Rush Reception will be on Friday, Sept. 18, at 7 p.m. at the Boca Backyard. The week is a great way for people to engage with organizations and for people from various organizations to meet one another. The Civic Media Center also prepares a guidebook to all the organizations involved. For more information or to participate, please email coordinators@civicmediacenter.org or call 352-373-0010. Soon after the City closed the Bo Diddley Plaza for construction March first, green screening went up around it. Fine. Then recently, the banners shown in the photo to the top right went up: 6 feet high, 10 feet wide, and 75 of them ringing the Plaza. You’d think there would be a city code about such tacky, ugly visual pollution. I guess not if the City does it. 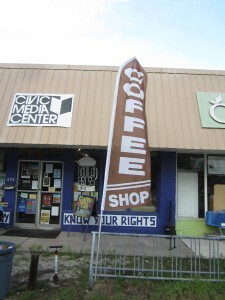 At bottom right is the Coffee Shop banner the Rad Press Cafe had in front of the CMC. Had. City Codes Enforcement came by and said it had to go or they’d be fined. The Rad Press Cafe had just reopened and the sign was helping draw people in. This is beyond absurd. I mean, really! On Friday, March 20, the Civic Media Center will present its 16th annual SpringBoard fundraising event with veteran journalist, Terry Anderson, addressing “Journalists: You May Not Like Us, but You’d be Sorry if We Were Gone.” In Terry’s words: “Journalists have popularity ratings lower than any other profession except lawyers. People accuse them of bias, of inaccuracy, of rudeness and arrogance. Your support of the CMC has multiple options. Membership of course is there, that annual donation in exchange for library check-out rights and the quarterly newsletter. Coming to events is a multiple winner; you get to see something cool, be around community people, and drop something in the donation box. Monthly direct deposit is really great and gives a sustaining income to the CMC. Volunteering to staff a shift gives you time to be in the space, peruse the collection, sit and read or help out with tasks. Inviting friends out to the CMC who have not been there is helpful toward creating new members and supporters. Even subscribing to the Iguana helps, because the Iguana gives a lot of free coverage to the CMC, and it needs to eat, too! The point is, the CMC is a great resource for the community, but it needs community input to survive. Films in January include “Food Chains” (19th), “Brother Outsider” (22nd), and “In His Own Home” (26th). There is music from Harmonious Wails and Blackfire on the 30th, and the great songwriting and performing of Pierce Pettis on the 24th. Trust me, these are great films, great performers. More is in the works for February. Keep up with the weekly email announcements; contact coordinators@civicmediacenter.org to get on that list. Yes, the Iguana toots the horn for the CMC a lot. 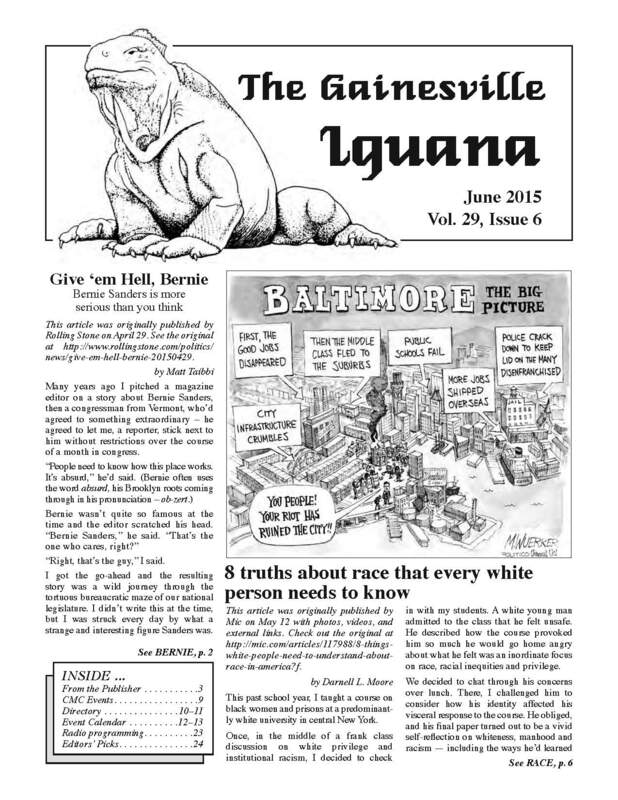 It is because the Iguana roots for the underdog, and trying to get coverage in the Sun, the Alligator, or on TV and radio is hard, partly because this great little town has so darn much other stuff going on. Do what you can as you can to help the CMC survive; there are no grants, no foundational support, just you. The Civic Media Center had a very busy October with its 21st Anniversary on October 18th, an extremely well attended presentation on the 22nd, and three very busy days serving as an acoustic venue for The Fest at the end of the month. All this was overseen by the CMC’s new co-coordinators, Kenzie Cooke and Nailah Summers. The October 22nd program featured two guest speakers. Dream Defenders co-founder and executive director Phillip Agnew came up from Miami, and Chicago-based poet, activist and educator Malcolm London came down. 130 crammed the CMC for their free-ranging talk, covering many aspects of activism in the 21st century, tools, tactics, and topics needing to be addressed in this age of militarized policing, media-induced fear-mongering, and the school-to-prison pipeline. Thanks to one of the CMC’s intrepid volunteers, the presentations were recorded and made into two 45-minute segment available on YouTube at https://www.youtube.com/watch?v=saGLyh3j7cU. NOTE: This story is constantly developing. As updates happen, we will update our site. The Civic Media Center has a special relationship with noted linguist and political dissident Noam Chomsky. The CMC opened its doors on Oct. 18, 1993, coinciding with a speaking engagement by Chomsky, and indeed had him dedicate our space and host the first events there — back-to-back discussions with local independent media publishers and with the UF Linguistics department. Ten years later, in 2003, Chomsky returned to speak in the O’Connell Center, where just over 6,000 people turned out for an event cosponsored by ACCENT, the student speakers bureau. So, with the CMC turning 20 this year, Chomsky was approached to return again, and this spring he agreed to come on Wednesday, Oct. 16. 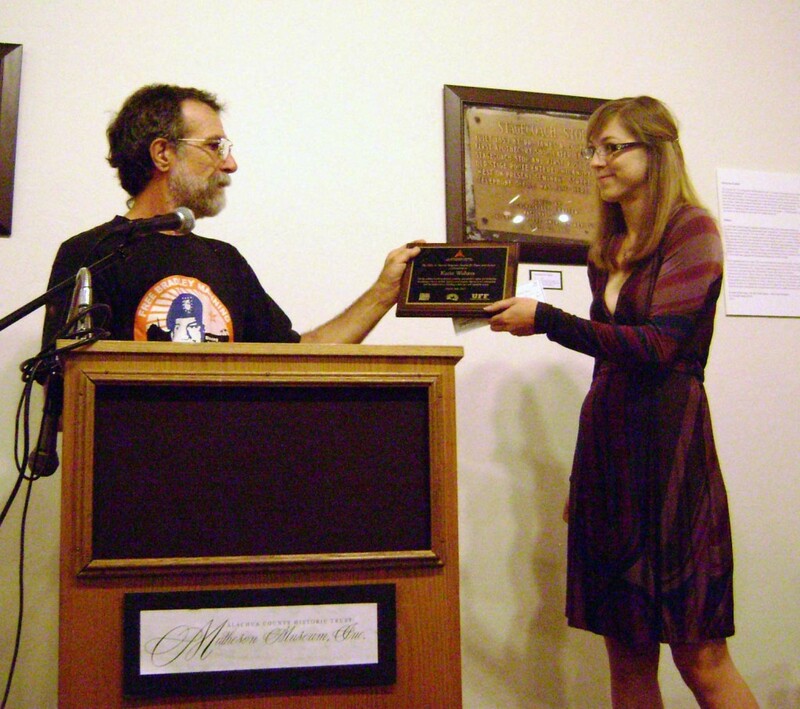 Joe Courter presents Katie Walters with one of the two Jack A. Penrod "Brigadas" Award for Peace and Justice. Photo by Jessica Newman. Every spring, the Civic Media Center holds what it calls its “SpringBoard” fundraiser. From its early beginnings, it was a house party at Board member Paula Stahmer’s until it outgrew the house and neighborhood, and a new home was found at the beautiful Matheson Museum. The featured speaker this year was Rob Lorei, the news director at Tampa’s fine community radio station WMNF. Lorei addressed the issue of the new forces at hand in our media, and the need for citizens to be active in helping document and spread information through the Internet and social media. He also spoke about how, even though many of us are frustrated with the middle of the road migration of NPR and PBS, they still need to be supported, even while being pressured to do better. Parts of the article below were borrowed from the obituary that ran in the Gainesville Sun. Charles M. Willett of Gainesville passed away Feb. 5 at E. T. York Hospice Center in Gainesville, three weeks after celebrating his 80th birthday with a large and festive family reunion. Charles was born on January 12, 1932 in New York City to Francis W. and Katherine T. Willett. He was educated at boarding schools and Harvard College with time out to enlist in the Army and volunteer for combat as a rifleman in the Korean War. Following college, he pursued graduate work in Munich and was accepted into the Foreign Service where he studied German and Czech. He served seven years as a diplomat in Germany and Austria. His experiences in Korea and Austria transformed his world view. Charles became an ardent pacifist, advocate for human rights, and would later become a champion of the alternative press. He earned an M.S. degree in Library Science from Simmons College and joined the American Library Association in 1974. 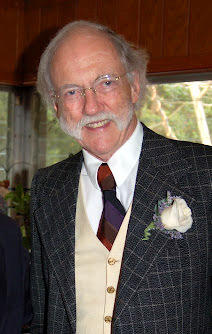 He served as librarian of Acquisitions and Collection Management at Harvard College Library, SUNY/Buffalo Libraries and the University of Florida Libraries. At the University of Florida, he was active in the faculty union. Following his library career, he worked as European Sales Manager for Ambassador Book Service.